Elvis Presley's doctor reported that "Elvis is doing well" came the message by Paul Harvey early in 2000. I listened intently to the announcement. What is this all about 20 plus years after "the king" was gone? A book had just been published under the title, The Truth About Elvis Aaron Presley. I, being hundreds of miles away from home on my job, immediately called my wife and had her to order the book. The book was certainly a conversation piece. You may recall that numerous people were skeptical about Elvis' death which is not unusual immediately after the death of an icon. The book was interesting but did not satisfy my curiosity. Yet, I contemplated the idea of how some famous people get tired of all the publicity at the expense of privacy. There is something special about time with one's self. It's a longed-for dream by some but realized by few. The legendary Johnny Cash purchased a 107-acre farm west of Nashville which served as the "center of his universe" for about 32 years. 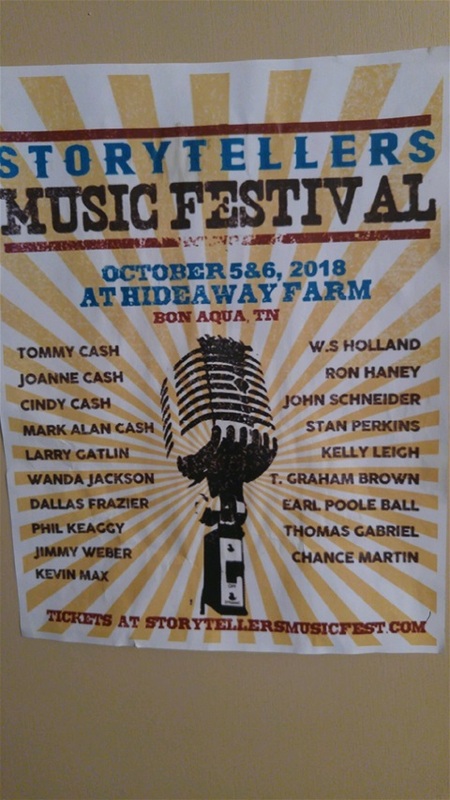 Well, upon learning of Patsy Andersen Presley's beginning a new job with the farm having been purchased by Brian Oxley it is being opened up for the pleasure of Cash's fans. Take a look at the list in the accompanying photo and go to www.storytellersmusicfest.com for a great weekend. Patsy just informed me that due to the illness of Wanda Jackson that Crystal Gale and BJ Thomas will fill in. Take a look at the list and see who's participating in the performances.